NOW YEW CAN BE DA TERROR OF YER NEIGHBORHOOD!! The new D’Orc outfit is da latest frum da twisted mind of Isaura Simons, and includes eberyfing yew need to metamorphasize into a terrifying Orc (da newest offering in da Wurld of Pawcraft series)! Goes on sale at Fantasy Faire! Everyfing yew need is here, including a scripted axe, and animated gesture! Hurry and get YERS! 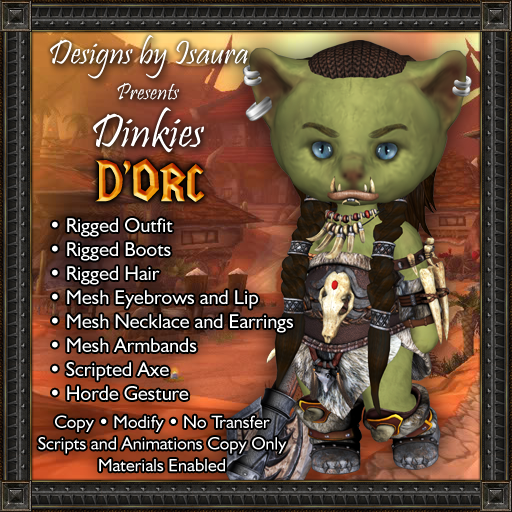 The package includes: Rigged outfit, rigged boots, rigged hair, mesh braces (2 on the forearm, 2 on the upper arm), mesh earrings, mesh mouth, mesh necklace, mesh eyebrows and mesh axe. It also includes a For the Horde! gesture, and the notecard has instructions for turning your Dinkie green (only for the white Dinkie avatar). The axe is safe scripted with a simple draw/sheath script.